People throw around the word “entrepreneur” like it’s a lifestyle trend. Many fancy themselves an “entrepreneur” with only the curiosity (or perhaps a lust) for building a business. Like movie or rock stars, many successful business leaders keep up a public image. Far too many people subscribe to entrepreneurship because it sounds and looks cool. Most fail to understand the real work involved. Building a business is very hard. With very few resources at hand, you must pull everything together through favors and very long hours. If you do not truly believe in what you are building, then it will never work. You must have a mission or product you believe in first before chasing your lust for business. Not only that, but you must have a mission or product that can inspire other people to help you and customers to buy from you. That’s a tricky thing to find. Most wannabe entrepreneurs forget that the core mission or product is what it’s all about. And it must come first. Find your core idea, set your mission, build a product, and then build a business around it. You cannot have a business without something to be busy about. I was raised to spend money on two things: travel and food. The latter I do everyday and with zeal. I love food more than almost anything else and treat it like a religious hobby. But like everyone, I appreciate a good deal. Dining out does not always carry a high value proposition over cooking at home. I cannot rationalize spending $12 on an Italian pasta when I can make it with ease at home for $3. I can, however, rationalize spending money on a multi-course, ingredient diverse meal that is too grocery-list intensive, time consuming and costly to prepare on my own. It is feasible on a normal night to prepare at most three dishes for a meal at home. I expect at least that many when going out to eat. The conventional American orders one entree when dining out. Unless it took 24 hours to prepare or imported some exotic ingredient from a land very far away, I often cannot justify spending double digits on a single entree. At the very least, I need to share entrees with other people. The more, the merrier! José Andrés is often credited for bringing small plate dining to the states. More common in Europe, small plate dining embraces the “a little bit of everything” philosophy by offering many dishes too small to sustain an entire meal. The result? You order multiple dishes per sitting and make an entire meal out of appetizer-sized portions. 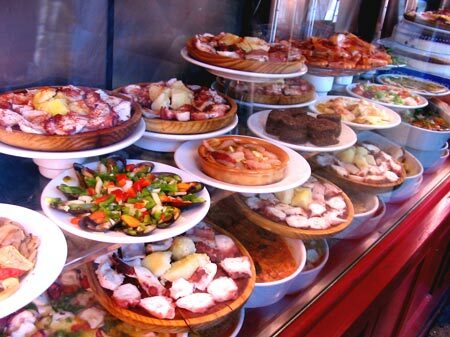 Antipasti and tapas are common on menus and in wine bars where sampling and tasting is a virtue. If you order correctly, you end up with a broad culinary experience nearly impossible and far too expensive to replicate on your own. I will not hesitate to drop three figures on a meal if it presents a large dynamic range of flavors and diverse composition of ingredients. Research your nearest tapas bar. Show your taste buds a party! Image by Ana Ulin, via Wikimedia Commons.